ISDP’s Sangsoo Lee and Alec Forss give the lowdown on South Korean President Moon’s visit to Pyongyang. Why did President Moon go to Pyongyang? This is the third time that Moon and Kim Jong Un have met within the space of just five months – a remarkable flurry of bilateral diplomacy given that seven years separated the very first leader summits between the two countries in 2000 and 2007. Previous meetings between Moon and Kim took place in the border village of Panmunjeom in the DMZ. Part of a three-day visit, this is the first time that Moon has visited Pyongyang, where he received a rapturous welcome as both leaders took to an open-top vehicle to be greeted by cheering crowds mobilized for the occasion. 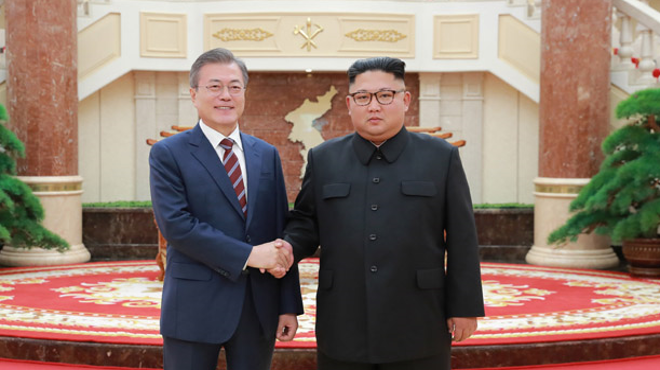 While seeking to maintain momentum in improving inter-Korean relations, Moon’s visit is both timely and pressing given that U.S-North Korea talks have stalled amidst much skepticism in Washington over North Korea’s intentions to denuclearize. Moon’s role has thus become crucial in persuading both sides to return to the negotiation table and offer tangible concessions to move forward. Did the summit accomplish anything new? Arguably the biggest achievement of the summit was that the two sides agreed to take future measures to reduce military tensions on their border areas. The military commitments were their priority issue as it was listed as article 1 in the joint statement presented by both leaders. The nuclear issue by comparison was listed as the fifth among six articles. This shows that the two Koreas have a strong willingness to lead the peace process on the Korean peninsula by themselves. Moreover, it seems the agreement will reduce the room for resuming U.S.-South Korea military exercises in the future. Regarding the measure for denuclearization, North Korea pledged not only to dismantle a missile testing site at Dongchang-ri in the presence of international experts, but also for the first time dangled the carrot of shutting down its main nuclear producing facilities at Yongbyon. However, it seems that North Korea’s actions in this regard will only take place only if reciprocal – and as of yet unspecified – steps are undertaken by the U.S. Apart from these, both sides pledged to advance economic cooperation including joint railway and road projects, stage more family reunions, and even make a joint bid for hosting the 2032 Olympics. It was also agreed that Kim Jong Un would visit Seoul by the end of the year. If this happens, it would be the first time a North Korean leader has visited the South Korean capital. What are the main challenges to deepening inter-Korean relations? There is a disagreement between Seoul and Washington on the speed of inter-Korean projects – such as reopening the Kaesong Industrial Complex – and North Korea’s measures for denuclearization. Washington is concerned that if inter-Korean cooperation progresses faster than its stalemated denuclearization talks with North Korea, this could undermine the U.S.’ leverage over Pyongyang and the impact of sanctions. As a result, Moon’s efforts in improving relations with North Korea will be challenged by pressure from Washington not to undermine the sanctions regime. Yet, Moon will also come under pressure from Kim, if he is seen not to be delivering what Pyongyang has requested, such as implementing inter-Korean economic cooperation and easing sanctions. Therefore, should there continue to be slow progress in U.S.-North Korea denuclearization talks, this will also slow down the implementation of planned inter-Korean cooperation projects. It’s a tricky balancing act for Moon. Moon’s approval rate has dropped in recent months. Does he still enjoy strong domestic support for his pro-engagement policy? For South Koreans at least, this third summit has not quite resonated as strongly as Kim and Moon’s first historic meeting in April – which had come after a period of sustained tensions when many feared that military conflict could break out. Nevertheless, sustaining dialogue and engagement with North Korea is supported by many South Koreans, especially if Pyongyang is seen to be reciprocating on denuclearization and reducing tensions. However, in the longer term, South Koreans are becoming increasingly concerned about the domestic economic situation with rising unemployment, an economic downturn, and mismanagement of the housing market. These issues are fueling his declining support rate and might take precedence for many South Korean citizens over inter-Korean issues and so undermine support for helping North Korea’s economy. Despite this, Moon still has a strong mandate to pursue engagement, with the political opposition being relatively weak. Will the recent inter-Korean summit lay the ground for U.S.-North Korea talks to resume? It looks likely. President Trump has reacted positively to the summit, tweeting (if perhaps somewhat erroneously) that, “Kim Jong Un has agreed to allow Nuclear inspections, subject to final negotiations, and to permanently dismantle a test site and launch pad in the presence of international experts.” There are also unconfirmed plans for a second summit between Trump and Kim. However, there still exist large question marks regarding perception gaps over both sides’ interpretations of their commitments from the June 12 Summit and how to sequence steps towards such. The U.S. continues to demand that North Korea take significant denuclearization measures first. North Korea, for its part, expects the U.S. to take measures such as signing a peace declaration before doing so. Trust and a bridging of expectations still remain fragile.